Zebras inclde several species of African equids (horse family) united by their distinctive black and white striped coats. The unique stripes of zebras make them one of the animals most familiar to people. They occur in a variety of habitats, such as grasslands, savannas, woodlands, thorny scrublands, mountains, and coastal hills. However, various anthropogenic factors have had a severe impact on zebra populations, in particular hunting for skins and habitat destruction. Grévy's zebra and the mountain zebra are endangered. While plains zebras are much more plentiful, one subspecies, the quagga, became extinct in the late 19th century – though there is currently a plan, called the Quagga Project, that aims to breed zebras that are phenotypically similar to the quagga in a process called breeding back. It was previously believed that zebras were white animals with black stripes, since some zebras have white underbellies. Embryological evidence, however, shows that the animal's background color is black and the white stripes and bellies are additions. It is likely that the stripes are caused by a combination of factors. 1. 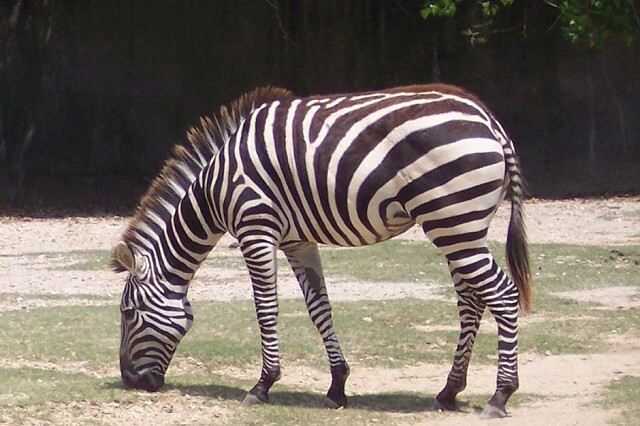 The vertical striping may help the zebra hide in the grass by disrupting its outline. In addition, even at moderate distances, the striking striping merges to an apparent grey. 2. The stripes may help to confuse predators by motion dazzle—a group of zebras standing or moving close together may appear as one large mass of flickering stripes, making it more difficult for the lion to pick out a target. 3. The stripes may serve as visual cues and identification. Although the striping pattern is unique to each individual, it is not known whether zebras can recognize one another by their stripes. 4. Experiments by different researchers indicate that the stripes are effective in attracting fewer flies, including blood-sucking tsetse flies and tabanid horseflies. A 2012 experiment in Hungary showed that zebra-striped models were nearly minimally attractive to tabanid horseflies. These flies are attracted to linearly polarized light, and the study showed that black and white stripes disrupt the attractive pattern. Further, attractiveness increases with stripe width, so the relatively narrow stripes of the three living species of zebras should be unattractive to horseflies.